Mere hours ago I was saying that we didn't have much information about Hearts of Stone—the first expansion for The Witcher 3—except for a few story beats and some information on quest levels. CD Projekt Red must have seen that post, because they've decided to send out a little press release with a release date, some screenshots, and even one of those tiny teaser trailers. We know from the announcement that this expansion contains more than 10 hours of story that takes place in No Man's Land and the Redanian city of Oxenfurt. 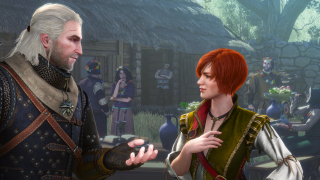 According to the press release, Geralt gets hired to take on a bandit captain called Olgierd von Everec, who happens to be immortal. Given the brief footage in the trailer, it looks like that goes about as well as you'd expect. Apparently you'll also get to party with a ghost, so at least there's that to look forward to.